The noncompete clause is having interesting consequences for business. The outrageous success of Silicon Valley may owe something to California’s adamant refusal to enforce noncompete clauses. Payback apparently. A MN company saved Cringely from his disastrous NerdTV launch (I told him I don't watch TV!). Now he's on their blog. I've added them to my feed of course, but I don't want the other writers -- I just want Cringely. Alas, it seems to be all or none for now. ...The Pentagon is claiming -- again -- the the Iranian government supplied the deadly 'explosively formed penetrators' (EFPs). But the more you study these devices -- which use an explosive charge to a convert disc-shaped metal 'lens' into a high-velocity slug capable of smashing through thick armor at an extended range –- the more likely they seem to be home-made in Iraq. The USSR built a hydrogen bomb quickly -- once they had the US plans. This is the same thing, on a much smaller scale. All it took was for Iran to deliver the plans, which may or may not have had government involved. If Iran did do it they won't have left any fingerprints; their intelligence services are considered among the best on earth. Welcome to the "age of the fast follower" (TM*). Chlorine truck bombs work the same way. It's hard to keep a technical age when the cost of havoc falls. ... It is not just the large numbers. The firing of H. E. Cummins III is raising as many questions as Ms. Lam’s. Mr. Cummins, one of the most distinguished lawyers in Arkansas, is respected by Republicans and Democrats alike. But he was forced out to make room for J. Timothy Griffin, a former Karl Rove deputy with thin legal experience who did opposition research for the Republican National Committee. ...Senator Charles Schumer, Democrat of New York, held a tough hearing. And he is now talking about calling on the fired U.S. attorneys to testify and subpoenaing their performance evaluations — both good ideas. Update: I realized neo-Stalinist was jumping the shark, but I'll stand by neo-Nixonian. ... Yet the Joyce Hatto episode is a stern reminder of the importance of framing and background in criticism. Music isn’t just about sound; it is about achievement in a larger human sense. If you think an interpretation is by a 74-year-old pianist at the end of her life, it won’t sound quite the same to you as if you think it’s by a 24-year-old piano-competition winner who is just starting out. Beyond all the pretty notes, we want creative engagement and communication from music, we want music to be a bridge to another personality. Otherwise, we might as well feed Chopin scores into a computer. When Schmich's essay was Vonnegut's it was famous, when it wasn't it vanished. The same problem afflicts research articles; many great contributions by the non-famous are published in obscure journals and only recognized in retrospect. The name of the author changes the perceived value. In day to day life many of us know the feeling of saying something that's ignored, only to hear it applauded when spoken by another. Humans are very susceptible to framing effects. It's not fair, but it's not going to change. A year ago I wrote about a deluge of research on autism genetics. Recent mouse models for autism and Down's syndrome are enabling radical new research directions. These models are the equivalents of the early telescopes -- radical new methods to investigate nature. It's hard not to be carried away with this kind of discovery. We may run into the kind of dead-ends that stymied human gene therapy. If the results are confirmed, however, they will stand as Nobel-quality basic science discoveries. Using canines to make fake fur: what's the true story? When does a story outrage Americans, and when do they ignore it? When I first read that Chinese manufactured fake fur garments almost always (24/25 in one sample) contained canine fur, I figured the furies would follow. They really haven't however, and it turns out that the story is several months old, and more complex than it first seemed (though I would advise boycotting JC Penney). After some reflection, I think this really belongs in the same globalization category as lead contamination of christmas lights. I'll explain why after the story. BTW, the racoon dog is a wild canine often trapped or farmed for its fur. Emphases mine. ... The Humane Society of the United States said it purchased coats from reputable outlets, such as upscale Nordstrom, with designer labels - Andrew Marc, Tommy Hilfiger, for example - and found them trimmed with fur from domestic dogs [jf: this is misleading, see below], even though the fur was advertised as fake. The investigation began after the society got a tip from someone who bought a coat with trim labeled as faux fur that felt real. Leppert and her team began buying coats from popular retailers and then had the coats tested by mass spectrometry, which measures the mass and sequence of proteins. Of the 25 coats tested, 24 were mislabeled or misadvertised, the society said. Three coats ... contained fur from domesticated [jf: meaning breeds domesticated in the US] dogs. The others had fur from raccoon dogs ... Most of the fur came from China. Importing domestic dog and cat fur was outlawed in 2000. Intentionally importing and selling dog fur is a federal crime punishable by a $10,000 fine for each violation. ... The discovery of domestic dog fur is the latest twist in the investigation that ensnared retail giants Macy's and J.C. Penney late last year. Both of those retailers were discovered selling coats with raccoon dog fur labeled as raccoon. J.C. Penney initially removed the offending garments from its stores around Christmas - but eventually it had employees scratch out the 'raccoon' label with black magic marker and put the coats back on the shelves. Macy's immediately pulled the items from its shelves. ... Mislabeling fur is a misdemeanor punishable by a $5,000 fine or a year in prison. Fur valued at less than $150 is not required to be labeled. A bill introduced by Reps. Jim Moran, D-Va., and Mike Ferguson, R-N.J., would close that loophole by requiring labels for all fur regardless of its value. It also would ban fur from raccoon dogs. ... Other retailers the Humane Society said sold mislabeled raccoon dog fur included Lord & Taylor, BergdorfGoodman.com and Neiman Marcus.com. Designers whose clothes were mismarked included Donna Karan's DKNY and Michael Kors. A coat from Oscar de la Renta advertised as raccoon had raccoon dog fur. I think I can reconstruct the real story, based on what's written here and my crotchety knowledge of how the world works. I bet that US retailers have known for years that Chinese manufacturers were using a wild canine, mostly farmed and hideously abused, to make convincing "fake fur". As long as the US retailers had plausible deniability they didn't care, and there was no law against using racoon dog fur. The mislabeling is merely a misdemeanor offense if the garment costs more than $150, and no label is required for under $150. US retailers probably didn't know, however, that some Chinese manufacturers were using dog breeds that, in many nations, are pets. That's a felony, and that's why they're anxious. If an executive were found to do this knowingly they'd get a criminal record, but I doubt any are guilty of that. The Humane Society is justifiably outraged about the maltreatment of the racoon dog, but they know most Americans don't care. They went looking for evidence of use of domesticated dogs and found it, which is why the story came out. This kind of thing (like lead contaminating holiday lights) is inevitable in a global economy with very different ideas about what's acceptable behavior and how seriously to treat foreign regulations and sensibilities. So how should we respond? Anyone who's done any mathematics will remember how some complex problems become trivial when you change the coordinate systems. It's a stunning thing to see and feel. The right framing of a problem can make the solution self evident. We see a similar phenomenon in studies of cognition; a seemingly complex problem can become easy for most people to solve when its translated into a social relationship structure. In special relativity problems changing the 'frame of reference' can make a difficult question easy. Do developing minds have growing pains? Developing bodies have growing pains, why not developing minds? Be the Best You can Be: Are cognitive improvements preceded by behavioral deterioration? ....We would then expect .... that major changes to critical cortical systems would be associated with substantial behavior and cognitive disruptions. ...First, for any problem there exists a perspective that makes it easy to grasp a solution, though that may mean waiting for a person as unique as Edison to come along. Second, across all problems no perspective or no heuristic is any better than any other. In plain English, any approach may be just as good as any other until it is tested. I don't buy it. There are confounding variables such as communications latency, ability to cooperate, response to incentives, and solution collision (multiple semi-compatible good quality solutions that, when combined, produce a weak result). Diversity is valuable, but I've never seen it trump ability by itself. Then, though, there are the BB’s in the universe: Boltzmann Brains. Random fluctuations of the fabric of spacetime itself which, most of the time, are rather insignificant puffs which evaporate immediately. But sometimes they stick around. More rarely, they are complex. Sometimes (very very rarely) they are really quite as complex as us human types. (Actually, “very very rarely” does not quite convey just how rare we are talking now.) And sometimes these vacuum quantum fluctuations attain the status of actual observers in the world. But, the rarest of them all, the BB’s, are able to (however briefly) make actual observations in the universe which are, in fact, “not erroneous” as Don Page put it. The thing is, when you start talking about very very…very rare things like Boltzmann Brains, you are talking about REALLY long times. Much longer than we’ve had on earth (and I mean 4.5 billion years) by many orders of magnitude. Numbers like 10 to the 60th years were being batted around like it was next week in this talk. By those times, all the stars and all the galaxies have gone out, and gone cold, and space has continued to expand exponentially and things are long past looking pretty bleak for the OO’s still around, who (we presume) need heat and light and at least a little energy of some sort to survive, even if we are talking about very slow machine intelligence (even slower than humans for example). CV provides some hilarious Conservapedia entries, please do read the post. At the moment the site is being overwhelmed by parody posts, but I'm sure it will settle down to a duller, but no less foolish, state. The good news is that any migration from Wikipedia to Conservapedia can only raise the IQ of Wikipedia. Jimmy Carter: can he be made a saint? Jimmy Carter, age 82, leads an underfunded and increasingly successful assault on river blindness. True, he's not catholic, but couldn't he be made an honorary saint anyway? I was going to title this "Give the man the damned peace prize already" -- but then I remembered that he finally got the prize in 2002. Update 2/25/2007: Rumor has it that Carter is pressing Gore very hard to run. I don't America is good enough to merit someone of Al's quality, but we do need him. I'm generally not in favor of the death penalty, but it is tempting to make an exception for wealthy entrepreneurs who kill thousands of people. Which brings me to tobacco. Tobacco executives sell an addictive product that, when used as directed, kills thousands. From a purely ethical perspective, disregarding minor details of law, are they substantially less evil than these counterfeiters? A colleague has been dropping off printouts of Paul Krugman's TimesSelect column to my desktop. I'm thereby reminded that there's nobody else in mainstream journalism willing and able to write fact based in-your-face disclosures of what Sauron (Bush/Cheney is the current incarnation) is up to. Krugman is Molly Ivins with less humor but a stronger platform and far more data. Now that Molly has died there's no-one else playing in this league. Alas, the NYT put Krugman behind their $50/year paywall. Conspiracy theorists figure this was a way to silence him, but I think the NYT made a bet-the-ranch decision that people like me would crack -- sooner or later. ...People who don't get insurance from their employers wouldn't have to deal individually with insurance companies: they'd purchase insurance through ''Health Markets'': government-run bodies negotiating with insurance companies on the public's behalf. People would, in effect, be buying insurance from the government, with only the business of paying medical bills -- not the function of granting insurance in the first place -- outsourced to private insurers. Why is this such a good idea? As the Edwards press release points out, marketing and underwriting -- the process of screening out high-risk clients -- are responsible for two-thirds of insurance companies' overhead. With insurers selling to government-run Health Markets, not directly to individuals, most of these expenses should go away, making insurance considerably cheaper. Better still, ''Health Markets,'' the press release says, ''will offer a choice between private insurers and a public insurance plan modeled after Medicare.'' This would offer a crucial degree of competition. The public insurance plan would almost certainly be cheaper than anything the private sector offers right now -- after all, Medicare has very low overhead. Private insurers would either have to match the public plan's low premiums, or lose the competition. And Mr. Edwards is O.K. with that. ''Over time,'' the press release says, ''the system may evolve toward a single-payer approach if individuals and businesses prefer the public plan.'" An author of a couple of interesting OS X apps, has a blog. I wrote a (brilliant, of course) comment on the blog -- but I fumbled the captcha. When the screen redrew, my comment was gone. A golden age can only be recognized in a rear view mirror. Once upon a time Al Gore was reinventing government, and governmental websites were often useful. Alas, in the reign of Sauron all those websites have been outsourced to the highest donor. Consider, for example, the process of renewing a child's passport. Now, I admit this is an extreme example. A few years ago our very dim congress decided that a child's passport must prove both citizenship and also, somehow, prove that the child is related to their parents. This made the process very complex - for every renewal up to age 14 (after which the child passes into yet another intermediate process). So the process is seriously bunged up to begin with. Even so, the obscure and confusing directions manage to make a bungled process even worse. From Special Requirements for Children Under Age 14 get the forms and print them. Find a post office that does passports. I don't know any way to find the hours they're open for this other than visiting them (!). In MSP (Minneapolis) the airport PO is open for passport processing from 9am-3pm seven days a week and it does photos as well. Other offices may be open on certain hours and days. There's usually no way to phone and discover the hours -- you have to actually make a specific visit to learn the hours. BOTH parents physically present, both with identification (I recommend carrying both drivers license AND passport for identification). just in case: adoption certificate andmarriage certificate if mother's name doesn't match the children's name. The last time we did this we weren't asked for these. The passport office will keep the original birth certificate and last passport. We paid the extra $60 for expedited service on the theory that it might reduce the rate of document loss and processing errors. I hate surrendering original documents. You can check the status of the passport renewal here. Read the official site for the official list, but the above works for us. I've written my house representative -- at the very least the Post Office hours and service information should be on a web site. Aetna's username policy requires a number. In the username. On the other hand, they authenticate using the same "security questions" everyone else uses. So if your account is cracked somewhere, the crooks can use your past "security" answers to get your Aetna account too -- even if they don't know your "secret" "username". Confusing the username with the password. That's rich. Aetna wins this month's stupid security policy prize. Router admin password: don't use the default! This was a big market a few years back, with products from Microsoft, Google, Yahoo, and others. I tried them all, and only Yahoo Desktop Search (X1) was worth the bother. Alas, it's gone now. Google Desktop Search is still around, but it doesn't treat folders with sufficient respect and it doesn't give me enough configuration options. Microsoft will focus on migrating users to Vista search, and of course OS X has spotlight, so there's only the soon-t0-dwindle XP marketplace for Yahoo to work with. I presume they entered this market in the first place to try to get YDS users to use Yahoo search, but I doubt that was worth the bother. It's especially not worthwhile now that Google has won the search wars. I may try the X1 product, though when I last tried it I was surprised to find that YDS was less buggy than X1! Update: I'm using it now. It seems as good as always, but I think YDS might have allowed me to do network shares -- X1 doesn't without an upgrade. In any case I don't need this feature -- my network is mostly OS X.
Update 2: Actually, it's better than YDS. I don' t think YDS included Eudora indexing, but this version of X1 does. Nice! When it comes to television, we're a bit retro. The kids watch Netflix videos (movies and tv) on an ancient CRT, but we don't do broadcast or cable. So when my 10 yo insisted on watching the super bowl while the youngers watched the CRT I had to scramble a bit. It worked, and I got a kick out of all the decades of technology that were trivially easy to lash together. In an era of Yet Another Proprietary Apple Connector the RCA AV plug is a shining beacon of lost hope. In front we have a 2006 Dell desktop monitor (HDTV!). The box is a junky DVD/video player with a broken DVD player and a working TV tuner - vintage 2000. Below the table is a vintage 1990 stereo. 1950s era rabbit ears sit atop the box. Fifty years of technology all working together to create a very low end home AV system. There won't be many more opportunities to put this mash-up together. Broadcast analog television is supposed to end in a year or so, though I personally doubt that will happen. A president may survive the greatest strategic debacle since Japan attacked Pearl Harbor, but ending broadcast TV is a recipe for annihilation. Cheap stuff that doesn't work: are we figuring this out? I don't think Apple has particularly good quality assurance. They do, however, have an incredibly strong brand and rabid and demanding user base --- including macintouch. I can wait until the base sorts the flops from the goodies, and then buy with reasonable expectations. Sure, I can still be burned by idiotic proprietary connectors, but at least I don't buy the world's most painful phone or a dysfunctional alarm clock. Most of the world's gizmos, however, don't come from Apple, Canon, Bose, Nikon, or any other company with a reputation to manage (are there any others?). They come from companies like SONY, Dell, and a large variety of fake brands (Zenith, etc) used by transient contract manufacturers. Some of the stuff works for a while, a heck of a lot doesn't. It mostly ends up in massive piles of toxic junk, and irretrievable hours of lost lifetime. It's a con job, and we've been unbelievably slow to catch on. The first step in our rehab is to restore the importance of brands with reputations. There are a few left -- buy from them. Our time is not a commodity. I think humans have hacked and buggy wetware. I predict that studies underway on the frequency of autism in Ashkenazi populations will show that some of the genes underlying autism also have adaptive advantages. In the meantime, we may be seeing this in schizophrenia: FuturePundit: Intelligence Boosting Gene Ups Schizophrenia Risk. The DARPP-32 gene provides a cognitive boost, but may also increase the risk of developing some forms of the mixed set of disorders we call "schizophrenia". This is what you see with "new" mutations that haven't been fully debugged yet. The sooner we understand how buggy all our minds are, the sooner we'll learn wisdom, tolerance, and forgiveness. I'd assumed we were still 10 years away from a useful quantum computer. A Canadian company is now advertising one: Scientific American.com: First "Commercial" Quantum Computer Solves Sudoku Puzzles. The experts believe this particular approach won't scale, but I'm stunned that they're already up to 16 bits. It also doesn't work do encryption tasks, so international finance can keep working. It apparently works rather like the analog computers my grad school adviser once played with. Don will be amused to learn that his analog skills are again on the cutting edge. So, how long until we do applied counterfactual computing? Does anyone still think we can predict twenty years ahead? I've been blogging periodically about the weirdness of a universe where quantum entanglement is real, but it was a somewhat supercilious essay in Wired magazine that convinced me I needed to read a real book ..
... In 1997, scientists separated a pair of entangled photons by shooting them through fiber-optic cables to two villages 6 miles apart. Tipping one into a particular quantum state forced the other into the opposite state less than five-trillionths of a second later, or nearly 7 million times faster than light could travel between the two [jf: probably instantaneously]. Of course, according to relativity, nothing travels faster than the speed of light - not even information between particles. I was sure I'd find a lot of books on the topic, but the best I could do was 'Schrodinger's Kittens' -- written about 13 years ago! I did find some a more recent text, but it belonged to what a Wikipedia article calls Dirac's "shut up and calculate" school . The other relatively recent texts I found were either fluffy or preferred to deal with familiar topics like modern cosmology. So what gives? Is this such a scary topic that almost no-one dares to explore what it means? Easy for Dirac to say -- he died before we were doing quantum teleportation, quantum encryption, and irrefutable entanglements. Update 2/15/07: After finishing the last chapter of Schrodinger's Kittens I understand why Graves setup the choice of 'reality is not what we think' versus 'no free will'. The 'transactional model' preserves our familiar "reality" of time and relativity, but the handshakes between past and future seem to constrain the future. In the enhanced (Wheeler) slit model, for example, the photon assumes its wave or particle behavior as it crosses the slit based on a handshake with the future absorbed photon. The nature of the future absorbed photon however, is based upon an observer choosing whether or not to "drop the screen". Since the photon adopts its configuration before the screen is dropped, however, the observer cannot really be choosing whether or not to drop the screen. The choice must be made in a way that's consistent with the form of the photon. Gribbin tries to dodge this trap with some handwaving about micro vs. macro causality, but it's obvious his heart isn't in it. There is an escape clause. Gribbin's framed the transactional model as being dependent upon a closed universe. We appear to live in an open (perhaps excessively open) universe (but see below). In an open universe, might we get a true arrow of time and the possibility of choice? Maybe one day, if we ever "understand it all", we'll learn that you can determine whether a universe is open or closed by testing for action-at-a-distance. ... It is entirely possible for the Universe to be closed but with accelerating expansion! All we know for sure is it is indistinguishably close to flat, and it is probably on the closed side of flat, pushed there by inflation. Update 5/13/07: My Amazon review of Gribbin's book. Five stars, despite being 12 years old. You know - SARS - the plague that was going to destroy civilization. It went away. Puzzled the heck out of me. It was supposed to recur every year or two, but it hasn't. Nobody seemed to be curious about this. Was a giant conspiracy at work? A double epidemic model for the SARS propagation (9/2003). I still don't understand why all hell didn't break loose then. My best guess is that there were multiple strains of SARS circulating simultaneously, and an innocuous one spread faster -- immunizing the susceptibles in advance of the killer strain. Ok, so I put my theory out more than a year after Ng et al published a full model supporting it! I gotta work on my timing. They must have started work on their model very shortly after the epidemic had started to fizzle. I didn't blog on this thought, but my theory back then (2004, not 2003!) was the Canadian nurses got so sick because they were so good at isolation -- they prevented exposure to the benign, immunizing, coronavirus and thus suffered the full impact of the malign virus. 1. This is a fascinating story that ought to appear in a popular magazine, or at least in The Economist or Scientific American. I don't recall seeing anything. There's a curious "chaotic" aspect to what gets written when. I wonder if blogs will change any of that, or if they simply amplify the current fads. 2. As a non-practicing physician who works on clinical knowledge representation I often think about the limits of the mental models I once used to care for patients. Back in the day we were taught to think of 'one infection, one disease'. Are medical students still taught to think that way, or are physicians now taught that illness (or its absence) may be the result of a number of interacting simultaneous infections (and of course susceptibilities, treatments, phases of the moon, etc, etc)? Of course I'm not sure what one would do with such knowledge! Still, it does help make one's predictions more modest. 3. This suggests a radical, but not entirely novel, approach to a future serious epidemic. Create a contagious synthetic pathogen that's relatively benign, but induces immunity to the major pathogen -- and spread it actively. I say not entirely novel, because this is how Polio was suppressed. The oral vaccine was an active contagious pathogen that was excreted in stool. It immunized a vast number of persons -- but some became sick, disabled, or dead. When Polio was less of a threat we switched to a non-pathogenic inoculation. The difference is the successful Polio strategy was probably unintentional (I suspect some people understood even in the 1950s), but in the future we'd be deliberately exposing an entire population to an immunogenic pathogen that would almost certainly harm many people. 2/15/07: Emily points out that this is rather like fighting a fire by setting fires -- backburning I think it's called. My son has a book on it called 'Hotshots'. A useful analogy. Gwynne Dyer surveys the worldwide industry of building walls between nations. There are many more of these than I'd imagined. Dyer makes a persuasive case that walls and fences are the future, an inevitable consequence of mobility and population growth. It's a unique essay, well worth a quick read. The dog: symbiote or parasite? ... Archer suggests, "consider the possibility that pets are, in evolutionary terms, manipulating human responses, that they are the equivalent of social parasites." Social parasites inject themselves into the social systems of other species and thrive there. Dogs are masters at that. They show a range of emotions—love, anxiety, curiosity—and thus trick us into thinking they possess the full range of human feelings. These are interesting theories. Raccoons and squirrels don't show recognizable human emotions, nor do they trigger our nurturing ("She's my baby") impulses. So, they don't (usually) move into our houses, get their photos taken with Santa, or even get names. Thousands of rescue workers aren't standing by to move them lovingly from one home to another. If the dog's love is just an evolutionary trick, does that diminish it? I don't think so. Dogs have figured out how to insinuate themselves into human society in ways that benefit us both. We get affection and attention. They get the same, plus food, shelter, and protection. To grasp this exchange doesn't trivialize our love, it explains it. I'm enveloped by dog love, myself. Izzy, a border collie who spent the first four years of his life running along a small square of fencing on a nearby farm, is lying under my desk at the moment, his head resting on my boot. Rose, my working dog, is curled into a tight ball in the crate to my left. Emma, the newcomer who spent six years inside the same fence as Izzy, prefers the newly re-upholstered antique chair. Plagued with health problems, she likes to be near the wood stove in the winter. When I stir to make tea, answer the door, or stretch my legs, all three dogs move with me. I see them peering out from behind the kitchen table or pantry door, awaiting instructions, as border collies do. If I return to the computer, they resume their previous positions, with stealth and agility. If I analyzed it coldly, I would admit that they're probably alert to see if an outdoor romp is in the offing, or some sheepherding, or some beef jerky. But I'd rather think they can't bear to let me out of their sight. And the answer is ... symbiote. I happen to believe, with a bit of evidence, that humans have almost uniquely flaky brains (Temple Grandin mentions this in one of her books as well). We have lots of very significant relatively recent evolutionary hacks in our wetware, and we know that hacks produce bugginess and instability. We have a high rate of major and minor defects -- as near as we can tell we're much worse off than any other animal. It's the price we've paid for sentience. A social animal with a buggy brain has a major need for psychic support. The dog is a first-rate psychic crutch. That's a heck of a value proposition. All hail the Dog! ... The first time teraflop performance was achieved was 11 years on the ASCI Red Supercomputer built by Intel for the Sandia National Laboratory. ... The Teraflop chip uses less electricity than many current high-end processors, making the design attractive for use in home computers. I can't think of anything to add. I'm awed. A Navy pilot and astronaut engaged in some exceedingly bizarre behavior. The media are all over the 'feet of clay' story. Maybe, but this behavior isn't simply an extramarital affair or a straightforward substance problem. It's profoundly weird. ... I have a bad marriage -- with my phone. ...The most serious problem is that licensing a DRM involves disclosing some of its secrets to many people in many companies, and history tells us that inevitably these secrets will leak. The Internet has made such leaks far more damaging, since a single leak can be spread worldwide in less than a minute. Such leaks can rapidly result in software programs available as free downloads on the Internet which will disable the DRM protection so that formerly protected songs can be played on unauthorized players. In this case, I think Apple is telling the truth. Of course they've known this all along -- though you have to wonder about the ROKR fiasco. The situation for movies is even worse. You can be sure someone is storing all the currently encrypted movies they can find, knowing that sometime in the next five years they'll be able to hack them all at once. More on DRM. 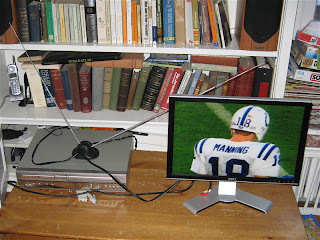 Also, see my 2005 post on how DRM wrecked my media center experiments. ... When I was an undergraduate (bear with me here) I spent a summer working at the Harvard-Smithsonian Center for Astrophysics. I worked with Sallie Baliunas, a CfA scientist who was a fellow Villanova astronomy grad, and was running an ambitious project to track chromospheric activity on a large sample of Sun-like stars. Sallie is an outstanding astrophysicist, and was a great advisor, as well as a friend. It’s no coincidence that I ended up going to grad school at Harvard’s astronomy department; the physics department didn’t like people from smaller schools and wouldn’t let me in, and Sallie helped convince the astronomy department to accept me. Sallie also was, and continues to be, very right-wing, of the libertarian variety. Letting the free market do it’s job was the best strategy in nearly any circumstance, she firmly believed. Her interest in stellar variability led her to contemplating the role of Solar variability in the Earth’s climate, and she became convinced that changes in the Sun were essentially the only important factor in explaining changes in the Earth’s temperature. In particular, that human-produced emissions had nothing to do with it. Nothing about this belief was influenced in any way by large piles of cash offered by oil companies. But, once her views became known, they were more than happy to provide platforms from which to spread them; she’s now an editor at Tech Central Station, as well as a fellow of the George C. Marshall Institute. Nobody could be more sincere in their views about climate change than Sallie is. I also happen to think that she’s dramatically wrong, as do the vast majority of (much more expert) scientists working on the question. But this is how the game is played — no need to bribe people when you can influence the public debate much more easily, and without fear that your targets won’t stay bribed. Unfortunately, oil companies have a lot more cash to spend on this purpose than the atmosphere does. Which is why public-minded scientists who agree with the carefully researched views of the IPCC need to keep hammering on the importance of doing something to fix this problem, before the damage is irrevocable. Philip Morris developed many of these techniques to slow public health attacks on smoking. Dissenting voices are important for the health of science, but these economic interests give them vast power -- somewhat to the detriment of science. The effect can work the other way too, if science showed that chocolate prevented cancer then the candy companies would amplify that as well. Alas, I have a hard time thinking of examples where this effect works to the good. Drug companies, for example, vastly amplified voices promoting estrogen therapy for menopause -- beyond what the science justified. The result was a fiasco. If there were an economic upside to promoting HIV dissenters, they'd have wreaked vastly more havoc than they have to date. (Oh, those politicians? PACs don't pay a politician to change their vote. They find politicians who favor their positions and fund their election and reelection. It's not so much classic bribery as it is selection - often selection for very dim people. This selection effect probably explains the past the incompetence of GOP representatives over the past 20 years. ... From the perspective of the White House, it was smart to blur the lines about what was acceptable and what was not in the war on terrorism. It meant that whenever someone was overzealous in some dark interrogation cell, President Bush and his entourage could blame someone else. The rendition teams are drawn from paramilitary officers who are brave and colorful. They are the men who went into Baghdad before the bombs and into Afghanistan before the army. If they didn't do paramilitary actions for a living, they would probably be robbing banks. Perhaps the Bush administration deliberately created a gray area on renditions. When does Amazon censor reviews? Recently I wrote a negative Amazon review of the Motorola RAZR V3M. It's pretty but dumb. Odd. I've written hundreds of Amazon reviews, I don't recall one being rejected before. I edited my blog review a bit, and tried again. I went back and reviewed the other reviews of this phone. There were very few, and they were very weak. Some were negative, but they didn't say anything that might really hurt sales. My review would hurt sales. It appears that Amazon is now censoring negative reviews of some products. Why this product? One hint might be that Amazon has a shady deal going with cell phones. If you buy on Amazon you get a significant cash discount -- but you sign up for a high margin plan. You have to keep the plan for at least six months, after which the cost of the plan equals the rebate you've received. If you don't cancel then, you pay through forever. I've been trying out Amazon's "premium" plan (pay up front, get free 2 day shipping). I was toying with continuing it and paying for it. Amazon, after all, has been providing great value through their online reviews. Now Amazon has greatly decreased the value of those reviews for me. I trust them much less. I won't sign up for their premium plan after all. ... “While our local TV network has a high-speed network for editing newsrooms, video servers, resource management with lots of PCs running Windows XP and expensive software, live titling is still done using a 1989-built Commodore Amiga 2000. Bought almost 20 years ago, the beast still runs great using a Maxtor 240MB hard disk drive, with a 25MHz 68030 processor and 68882 math co-processor running Amiga DOS 3.1, and overlaying graphics to live video using a GVP G-Lock device. It has a total of 10MB of RAM. We have to go around in thrift shops hunting down Amiga 500s, Amiga 2000s for spare parts, keyboards and mice. Even a CDTV was victimised to get a Fat Agnus 8372A chip. The computer runs Scala IC500 as a titling program and it still runs great. We transfer data from the Windows boxes using 720KB formatted 3.5- inch diskettes.”.. Many of the other examples in this fun article are OS/2 machines. In addition to sheer cussidness, absolute security from bots and viruses is a winning advantage. Hardware has improved exponentially over the past decade, though no consumer prooduct will ever again equal the tank-like construction of my original Panasonic  manufactured 8086 box. Software hasn't even managed a linear improvement; we had better wordprocessors 10 years ago than we have now. ... At the heart of this video distribution problem is the lie that ISPs tell about how much bandwidth we are really buying. While you may think your 1.5-megabit-per-second DSL service or your 3-megabit-per-second cable modem service is actually backed by 1.5 megabits or 3 megabits of Internet bandwidth, they really aren't. ISPs provision backbone access based on the expectation that people usually aren't on the Internet, and even when they are on the Internet most of their time is spent reading the screen, not actively sending or receiving packets. As such, ISPs have been able to get away with buying 20-30 KILOBITS per second of Internet backbone capacity for every MEGABIT per second of Internet service they are selling at retail. This 20-to-1 provisioning ratio of what's sold to what is promised (and believe me, 20-to-1 is me being generous to the ISPs since it is probably much higher than that) is what creates the burgeoning Internet video problem. So if ISPs would simply provision the amount of bandwidth they are selling us there wouldn't be a problem, right? Alas, that's not the complete story. What would appear to be an obvious solution to this impending problem is increasing effective backbone bandwidth for every broadband user. There is no LOCAL bandwidth crisis, just an INTERNET bandwidth crisis. As I've explained over the last two weeks, Google is going to solve this for us in exchange for taking the majority of global advertising revenue. Maybe that's the answer, in which case we don't have to do anything. But if Google doesn't step in appropriately or you'd rather not rely on Google for some reason, there is the alternative of going with a different ISP. If you want a beautiful Internet video experience, one answer might be to buy service from a broadband ISP that will allocate more backbone bandwidth per account. If you are a DSL user, you have a choice of ISPs in most markets. They all go through the local phone company, of course, but that phone company has no problem allocating the rated value of the DSL line because to the telco that last mile bandwidth is free. My DSL ISP is MegaPath and they buy a 1.5-megabit-per-second circuit from BellSouth (now AT&T I guess, but the trucks don't say that yet) and it can really carry 1.5 megabits per second 24/7, no problem. The problem is that MegaPath then makes me share a DS3 (45-megabit-per-second) connection to the Internet with every other customer of theirs in my LATA or service area, so in practice I get a LOT less than my 1.5 megabits. Another post rescued from my archives. This SciAm article on Globalization was published in April of 2006. I hope to add the key points to my old web page on reducing poverty. Science & Technology at Scientific American.com: Does Globalization Help or Hurt the World's Poor? .... Capital controls. The flow of international investment consists both of long-term capital (such as equipment) and of speculative short-term capital (such as shares, bonds and currency). The latter, shifted at the click of a mouse, can stampede around the globe in herdlike movements, causing massive damage to fragile economies. Many economists (including those who otherwise support free trade) now see a need for some form of control over short-term capital flows, particularly if domestic financial institutions and banking standards are weak. It is widely believed that China, India and Malaysia escaped the brunt of the Asian financial crisis because of their stringent controls on capital flight. Economists still disagree, though, on what form such control should take and what effect it has on the cost of capital. Social programs. Many economists argue that for trade to make a country better off, the government of that country may have to redistribute wealth and income to some extent, so that the winners from the policy of opening the economy share their gains with the losers. Of course, the phrase "to some extent" still leaves room for plenty of disagreement. Nevertheless, certain programs stir fairly little controversy, such as assistance programs to help workers cope with job losses and get retrained and redeployed. Scholarships allowing poor parents to send their children to school have proved to be more effective at reducing child labor than banning imports of products. Research. The Green Revolution played a major role in reducing poverty in Asia. New international private-public partnerships could help develop other products suitable for the poor (such as medicines, vaccines and crops). Under the current international patent regime, global pharmaceutical companies do not have much incentive to do costly research on diseases such as malaria and tuberculosis that kill millions of people in poor countries every year. But research collaborations are emerging among donor agencies, the World Health Organization, groups such as Doctors Without Borders and private foundations such as the Bill & Melinda Gates Foundation. All search is not equal. A lost child will almost always have a significant search, but an attractive child of a wealthy, famous, and attractive family will get a better publicly funded search than a poor child. A woman will generally get a better search than a man, and a childless middle-aged man taking risks should not expect the most massive of searches. Dr. Gray, a wealthy researcher lost at sea, is receiving a grade A publicly funded search, as well as the extraordinary private resources of an extremely wealthy community. I'm a bit jealous, but only a bit. Whatever it takes, I'll root for the miracle. I came across this Economist article almost two years ago, but it was lost in my unpublished drafts. It deserves a bit of attention, so I'll resurrect it today. Emphases mine. Note the role of the UN and the Bangladeshi soldiers. .... This article is concerned with the toughest cases: states that have lost control over most of their territory and stopped providing even the most basic services to their people. Only Somalia unambiguously fits this definition. A larger group of countries, mostly in Africa, are close to failure (see chart). Some, such as Zimbabwe, are cantering towards a cliff-edge. Others, having recently failed, appear to be recovering, if fitfully: Afghanistan, Haiti, Sierra Leone and Liberia all fall into this category. States can fail because of external shocks, or they can decay from within, or both. Afghanistan and Angola collapsed when their colonial overlords suddenly withdrew. In Sierra Leone and Congo, the state was looted into putrescence, thus inviting rebellion and ultimately, collapse. It is tough to mend a failed state, but the fact that some formerly failed states are now doing quite well—eg, Mozambique and East Timor—shows that it is not impossible. And although treatment is costly—the UN mission in Liberia costs $800m a year—the cost of doing nothing is often higher. When governments collapse, it is not only bad for citizens who thereby lose the law's protection. It can also cause regional or even global repercussions. Lawlessness, it is often argued, creates space for terrorists to operate. This is sometimes true: there are almost certainly al-Qaeda operatives lurking in Somalia and the wilder parts of Pakistan. But the most-cited example, Afghanistan, does not really support this argument. Osama bin Laden used Afghanistan as a base not because it was a failed state, but because its government invited him to. ... The chief reason why the world should worry about state failure is that it is contagious. Liberia's civil war, for example, infected all three of its neighbours, thus destabilising a broad slice of West Africa. Congo's did the same for Central Africa. ... Looking only at war-torn states, Mr Collier and Anke Hoeffler, also of Oxford, found that three types of intervention were highly cost-effective, even before one considers the value of saving lives. Another worthwhile tactic is to offer generous aid to war-flattened countries, once they have stabilised a bit, so that they can rebuild their buildings and institutions. Mr Collier and Ms Hoeffler estimated that increasing aid to post-conflict countries by the equivalent of 2% of GDP per year for five years, starting half a decade after the war ended, would cost $13 billion but yield $31.5 billion in benefits. By far the most cost-effective way of stabilising a failed state, however, is to send peacekeepers. Mr Collier and Ms Hoeffler calculated that $4.8 billion of peacekeeping yields nearly $400 billion in benefits. This figure should be treated with caution, since it is extrapolated from one successful example. In 2000, a small contingent of British troops smashed a vicious rebel army in Sierra Leone, secured the capital and rescued a UN peacekeeping mission from disaster. Not all interventions go so well. But a study by the RAND Corporation, a think-tank, suggests that the UN, despite its well-publicised blunders, is quite good at peacekeeping. Of the eight UN-led missions it examined, seven brought sustained peace (Namibia, El Salvador, Cambodia, Mozambique, Eastern Slavonia, Sierra Leone and East Timor), while one (in Congo) did not. An earlier RAND study had looked at eight American-led missions and found that only four of the nations involved (Germany, Japan, Bosnia and Kosovo), were now at peace, while the other four (Somalia, Haiti, Afghanistan and Iraq) were not, or at any rate, not yet. The comparison is not entirely fair. The Americans took on tougher targets: Iraq has more suicide-bombers than East Timor. On the other hand, the UN had punier forces and budgets at its disposal. The annual cost of all 11 UN peacekeeping operations today is less than America spends in a month in Iraq. ... The UN secretary-general's “special representative” in Liberia, a forceful American called Jacques Klein, is the most powerful man in the country. He may lack an “executive mandate”, including the power to arrest people, such as the UN had in East Timor, but his budget is roughly ten times larger than the Liberian government's. A UN embargo on Liberia's main exports (timber and diamonds) remains in force, pending proof that the money is not falling into the wrong pockets. .... But pacification is only the first step. To ensure that a recovering failed state does not fail again, it needs a government that is legitimate and competent enough not to invite another rebellion. And nation-building is the hardest task of all. ... Practically nothing works in Liberia. There is no piped water, no functioning justice system and the closest approximation to a middle class is 60,000 civil servants who have hardly been paid in 14 years. There are 450,000 prosperous and well-educated Liberians, but they live in America and show no sign of returning. Liberia is not even ranked on the UNDP's annual “human development index”, for lack of data. “We're fighting to get to the bottom of the list,” says the UN's Mr Klein. ... What if the astonishing proclamation made by top gooberhead Scientologist (and official Friend of Tom) David Miscavige is urgent and accurate and Tom Cruise really is that happy cult's personal Jesus, a true deity who may not be recognized in this lifetime for his divine contributions but who, in the future, will be 'worshipped like Jesus' for what he has done for humankind and therefore we have all been looking at 'Jerry McGuire' and 'Days of Thunder' and 'MI:III' exactly wrong? It's easy to mock scientology, the peculiar mind of its founder, and its alien engrammatic infestations, but is it really much more odd than ultra-high-tech warfare in the ancient americas? Are the Nephites all that more peculiar than deities mating with human females (virgin or not)? Is supernatural parenthood all that more unusual than the idea that humans have some universal right to power over, say, slugs? Really, it's glass houses all the way down. Maybe in a thousand years Tom Cruise will look pretty good. Personally, I doubt it, but I am reasonably sure stranger things have happened. ... Today, we're taking another step toward making personalization more available to you by combining these two into a single signed-in experience. Now, when you're signed in, you'll have access to a personalized Google—one that combines personalized search results and a personalized homepage. Search that learns what I like, a part of Google’s reputation management strategy. The more value that’s attached to my Google identity, the more likely I am to use it, the more Google knows about me, the better the ads get. BTW, I have some curious things show up in my searches nowadays. For example, a ‘Note this’ link that lets me add any result to my Firefox/Google Notebook.